Analytics and data warehousing solutions provide BI capabilities that go beyond Crystal and Excel-based reporting. If you struggle getting the right information out of your ERP system, or if you have a need for more sophisticated analytical capabilities. Join our webinar session and you will learn about the fundamental business and technical benefits of analytics and data warehousing technologies, and what they will enable you to do beyond basic operational and financial reporting. We will also review market trends in business intelligence, and present case studies of how analytics and data warehousing have been implemented and what benefits were derived. It deploys in hours or days — costing a fraction of comparable up-market BI solutions. DataSelf BI was built from scratch for mid-size organizations — based on 10-plus years of experience helping mid-size organizations implement business intelligence. We wanted a better solution than we could find on the market, so we made one ourselves. 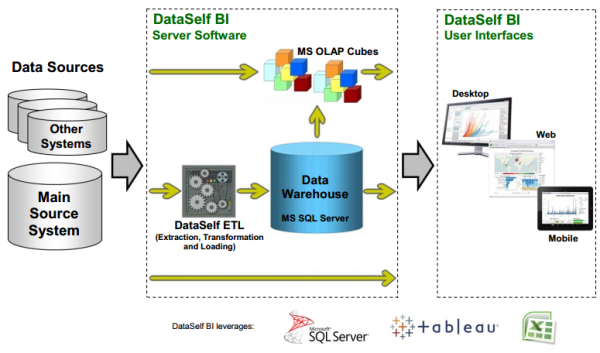 DataSelf BI provides a wide range of high-end BI features such as analytics, budgeting, consolidation, dashboards, data analysis, data mining, data modeling, data warehousing, ETL (Extraction, Transformation and Loading), financial reporting, forecasting, KPIs (Key Performance Indicators), multidimensional analysis, OLAP cubes and operational reporting. Optional components: balanced scorecards, BAM (Business Activity Monitoring), EDI, MS Office PerformancePoint Server (PPS), MS Reporting Services, MS SharePoint Integration. Download datasheet to learn more.